Test post - will this show up in featured? Heading into fall, back to school, and of course, what is soon to be cold and flu season, family wellness is definitely on my mind. If you've been reading along with me for any amount of time, you probably know we prefer to be proactive, rather than reactive, when it comes to F&B's health, and that we lean a bit more towards the natural, crunchy side of healthcare. (And no, we do not do flu shots; I get asked that a lot.) But since I can't keep the kids in a bubble, we try to utilize some common sense tips to keep everyone healthy during this season. However, my top three favorite tips are below. Hand-washing!!! I swear, it's the most obvious tip in the world sometimes, yet I still have to remind the kids constantly to wash their hands. We'll come in from martial arts, where they are doing push-ups on mats, and I still have to say "Hey, would you wash your hands *before* you touch food?" They do enjoy picking all the pretty Bath & Body Works scents, so that is an added bonus in the handwashing plan. Tea--For mild sore throats, I highly recommend tea with honey or for sinus aches, mint tea. Shaun uses Throat Coat tea on recommendation from another friend of ours. Now, I don't swear that any of it really has medicinal properties, but it makes me feel better. And as long as I'm feeling better, in my book, it works! How about your family? Anything natural you swear by to promote family wellness? Foods, herbal treatments, do share! Back to school, of course, means back to school shopping, and my darling daughter has hit the point where she has definite opinions on what she wants to wear. Of course, living in North Texas, she spends most of her time in shorts and flip flops, which are great for around the pool and less so for running around the playground. And since her style tends towards leggings or capris with cute shirts, regular tennis shoes are no longer acceptable footwear for many outfits. Perhaps, she may wear them with track pants, and maybe with jeans, if there is a whole lot of outside running around going on, but it's all about looking just so. When I got the chance to do this post, I was quite happy to find out that the Crocs Back to School kids' line are school-approved on the outside (because they're close-toed and close-heeled), but have the same comfort in the inside. And they have 13 new styles for boys and girls from K-8. And they are actually cute. Cute is imperative to the almost-9 year old girl, probably the most important element. The Genna maryjane style is so cute and so Faith! And I really like the Dawson sneakers for girls, especially with chocolate brown pants. All the styles are located on the Crocs website, along with a chance to win a family vacation to San Diego! There are several cute ones that Ben likes too, although he's much easier to please than his sister. I think it's a boy thing! Which ones are your favorite? Don't forget to check out the Crocs music video. It's interactive too, just click on the shoes in the video to see them on the Crocs website! Keep an eye out too for the hidden Easter egg, click on it (when you find it) to see what happens. Hint: You're looking for one of these! This month's Hormel challenge was a BBQ one, which was completely perfect while we were in Canada, since my dad was happy to assist in the grilling part of it all. The mission--host a delicious barbeque feast for friends or family! 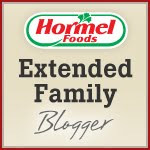 You must use at least three products as ingredients for your meal from the Hormel Foods portfolio. Sounded like a plan to me, and my parents have a big garden in the backyard that was already started to produce tomatoes, zucchini and peppers. And my dad did recently buy a pineapple for the kids. All this, plus a barbecue, means kebabs, of course! Since we were in Canada, I headed over to Buffalo for a little bit of grocery shopping with my product list. 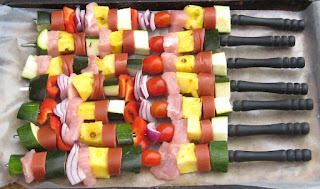 My key plan being a) kebabs and b) must go well with pineapple and zucchini (two of Ben's favorite things). On my meal planning days, I usually have a solid list, but I wanted to see this time what inspiration I could find at the store. 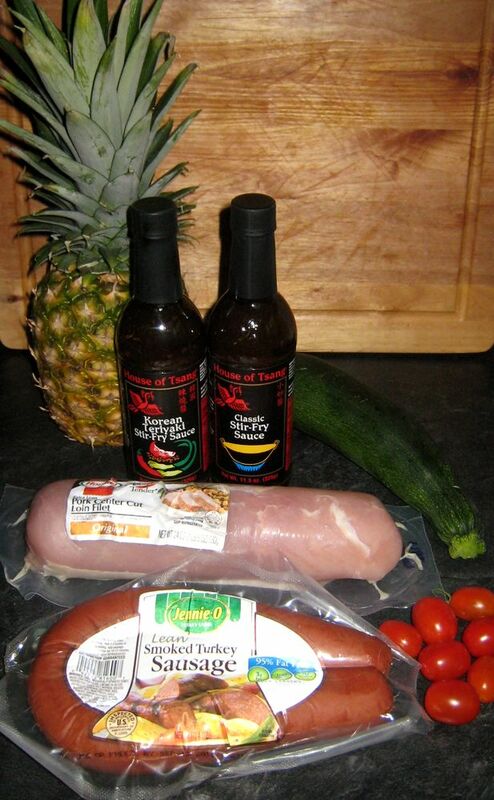 After a bit of shopping, I settled on Hormel pork tenderloin and Jenny-O turkey sausage for the kebabs, along with two types of House of Tsang marinades, Classic Stir Fry and Korean Teriyaki to baste the meats and veggies with. 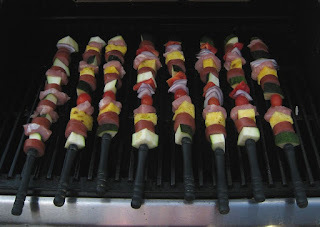 I had a plan in my head for how I wanted the kebabs to look and, other than the pineapple, the veggies are extremely locavore, right from my mom's garden. I sliced the tenderloin into four long quartered sections and cubed those to make the pork pieces, then sliced the sausage into rounds. 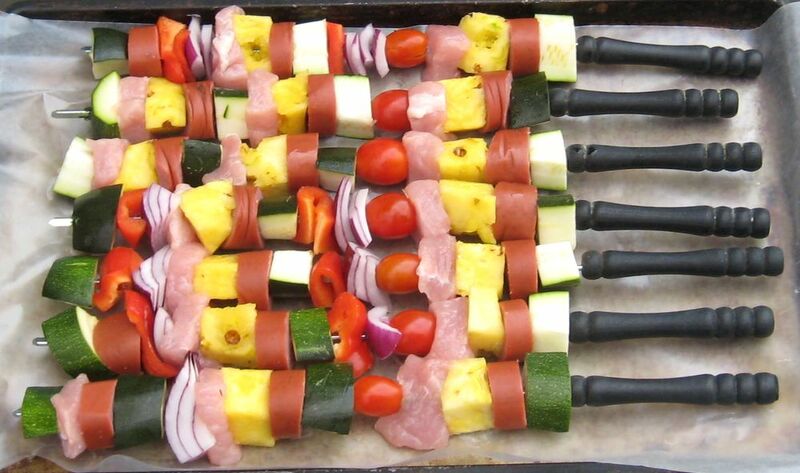 The meat is alternated with a combination of pineapple, zucchini, cherry tomatoes, onion and red pepper, which started out just-so, and ended with a really odd last skewer of random things that were still on the plates. My dad fired up the grill (since I will NOT turn on a grill) and brushed it with olive oil. The skewers fit perfectly into the grooves and we opted to baste them with the House of Tsang Teriyaki marinade. It is seriously good and I'm sorry I had to leave the rest of it at my parents' house (couldn't take it on the airplane, buying my own bottle at Kroger asap!). We served the kebabs over steamed rice with soy sauce (something F&B learned from Shaun). We also debated stir frying fresh beans from the garden with the House of Tsang Classic Stir Fry sauce, but it would have been a bit too much food, so that was tabled for a different meal. It's definitely worth trying too! To win, leave me a comment below telling me one of your favorite summer grilling ideas! Since it's going to be well over 100 degrees in Dallas for the foreseeable future, turning on my oven is NOT a plan! Winner will be selected next Monday night (August 8th) via Random.org! ETA: Winner was post #8, Cathy! F&B and I got the chance to sample a new cupcake product a few weeks ago--Betty Crocker Fun-da-middles. What are Fun-da-middles, you might be asking? They are cupcakes with the frosting inside. Each package of Fun-da-middles comes with the cupcake mix and a filling bag, so the creamy fillings bake right inside. F&B loved the idea and I found it so much better than icing on top for the Dallas heat. And really, it's pretty hard to go wrong with cupcakes. Fun-da-middles are available in 3 flavors--Vanilla Cake with Creamy Chocolate Filling, Chocolate Cake with Creamy Vanilla Filling, and Vanilla Cake with Creamy Vanilla Filling. We sampled the vanilla cake/vanilla filling combo and loved it, although I really really want to try the chocolate one! Would you like a chance to win a sample of one of the mixes before they hit the shelves? Leave me a comment telling me your favorite summer treat and a way to reach you. I'll draw a winner at the end of next week (7/22). Do you have a little boy? 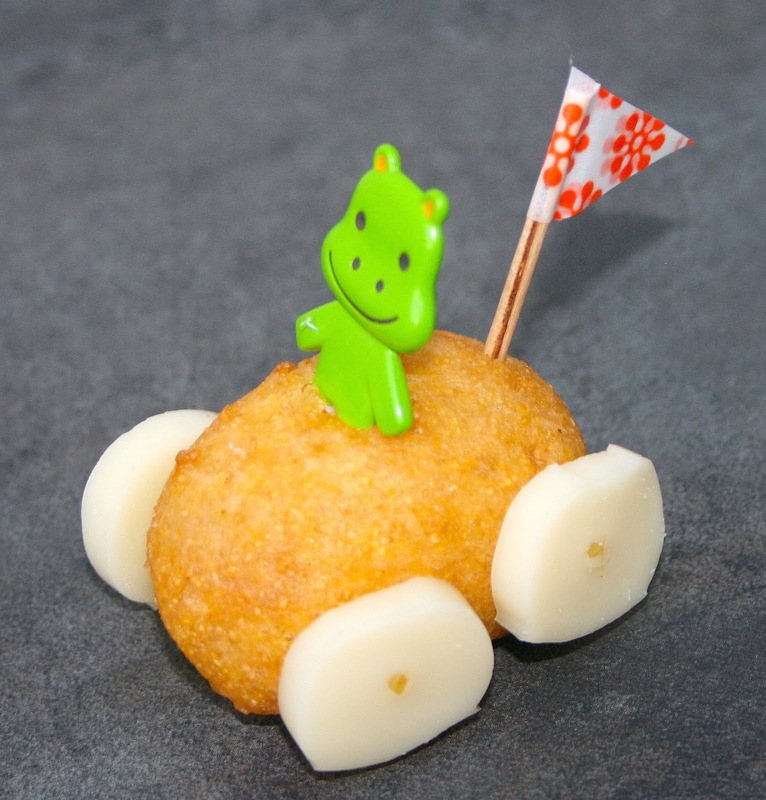 Have you been hearing non-stop about the fact that there is a Cars 2 movie coming out? Are they just a little tiny bit excited about it? Besides the new movie, Kimberly Clark is providing incentives for moms to stock up on their products. Select Kimberly Clark products, such as Kleenex, Cottonelle, Scott, Viva, Huggies and Pull-Up brands, are marked with special Cars 2 logos and features codes to enter on the Kimberly Clark website and redeem for Cars 2 merchandise! and enter the code found on the black box on the label. Points can be redeemed for Cars 2 merchandise, including movie tickets, coloring books, character die-cast cars and more! The kids were more than happy to get some of the cute tissue boxes. We're still into our recycled art projects, so it was even nicer to have some cute tissue boxes for Ben to work with. I think he's turning his into a garage! Disclosure: I received Cars themed Kimberly Clark products for the purposes of this post, through a partnership with Mom Bloggers Club. All opinions expressed are my own.